The Fluval flex is an innovative nano aquarium with a lighting rig incomparable to other tanks. Its very well designed with a nice curved front, plus filter compartments at the back to hide all the ugly parts. The lighting is controlled by a remote control to allow you to find the colours that most enhance your fish and plants. I personally have one of these tanks (see below) on my office desk and its my favourite small tank thats reviewed on the site. The tank is nice and easy to setup as you’ll see below and the design of it with the curved front makes it easy to get a good look. I’ve used this tank in my blog here – How to setup a planted nano aquarium – Which will walk you through all you need to know about the tank and creating a good look. I’ve now got the tank fully up and running with a nice rock mountain looks as you’ll see further down the page. The longer I’ve had this tank the more impressed I am with it. It’s really easy to setup and maintain, which is key when choosing a small tank, but still gives you enough room to be creative with the scene inside. I’ve got mine as a planted shrimp tank with some harlequins and rasboras in along with a few baby guppies from my larger tank (Where they won’t stop breeding!). You can buy the tank from Amazon above (Which is where I got it from – next day delivery). I ordered my tank from Amazon and it was delivered the next day and well packaged. As you can see below the tank its well packed in its own box and was also covered in an Amazon box with air bags for extra protection. In the box you get the tank, lights, remote control, filter pump and media, flow controller and a none slip mat to place the aquarium on. To start with you need to take the filer media out of the plastic bags and slot them in the holes they came from – still in the mesh bags, rinse them under some clean cold water, then return this to the middle column. Then place the filer media back in the centre section. On the right site of the tank (the part with the hole and not the slots – some tanks vary which side its on) place the pump and out flow tube. You then need to screw in the flow controller through the hole as you see below. Now you need to rinse out the tank with clean water and wipe with a clean damp cloth – DO NOT USE SOAP! 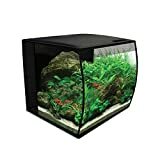 If you’re setting the tank up as a tropical aquarium then you’ll need a heater to add to the tank – there’s loads of these available and our recommended nano heater is the Fluval 50w heater (You can get the exact one here) that covers tanks up to 60l so is still good if you have the larger version. Here’s my initial tank setup with a rock feature, gravel path and the initial grass planting done. It will be left like this for a few days before the filter is turned on, then the fish and shrimp added later. After running the Flex like this for 3 days I then turned the filter and heater on and ran it empty for week to make sure the temperature was right and held. This also gave the tank some time to settle before adding any fish or shrimp. The next step was to start adding some C02 to really help the plants grow – you can read about adding pressurised C02 here. As we mention lots on this blog, it’s important to add the fish slowly and ignore the temptation to go to the local fish shop and buy everything you like the look of. As this tank was setup as an over flow of my breeding shrimp and guppies I started with 2 red shrimp and 3 juvenile guppies (small but with a bit of colour starting on the tail). I then left it another week and added more fish to complete the tank over the coming 3 weeks, just adding 3-5 at a time. After it had been running for a few weeks and the grass was well rooted I’ve added a couple of small algae eaters – these can disturb the grass if its not well rooted. I get asked a lot about fish going into the end filter compartment through the holes. In my tank I have left it uncovered as the fish and shrimp go in and out as they please. In 6 months of running the tank I’ve only had one fish make it all the way to the filter pump section. If this is something you’re worried about then you can add some thin gause over the cover to stop it happening. The tank will need general maintenance to keep it clean such as cleaning the filter sponges. These can be easly removed and cleaned under water. There is a part of the cleaning thats easy to miss – the filter in the pump! If you don’t clean this you’ll notice the water in the pump section get lower and lower as the pump struggles to work. Take the filter apart as shown below and clean the filter sponge to get it working correctly again. Tip – You’ll need to remove the tube first to get it apart, this simply unscrews from the bottom. If you’re going away here’s our guide for how to look after the tank – This does vary depending on what you have in it. I’d do a clean 3/4 days before you go and make sure the water level is nice and high. Doing the clean a few days before means you can make sure they’re okay before you set of. I’d set up a timer for the lights and turn off the C02 if you have a planted tank. I’d reduct the lighting by a couple of hours a day to reduce any algae build up. I’d us an appropriate feeding block for the fish you have. As above with the feeding block and the plug. Over 2 weeks its advisable, if you can, to get someone to check on the tank. Some feeding blocks only last a week and the water level may beed topping up. Take the tank to a friends house and get them to look after it if you’re away for that long! hi we bought one yesterday.. easy set up ..however the pump/ filter is rather noisy.. should this be like that? Possibly has some air in it – mine was noisy initially but has quietened down now. I also find that adjusting how the filter cable is coming out of the tank can change the noise output significantly too. What size submersible heater does the flex 57 need? A 50 watt heater is suitable for the 57L Flex. Purchased this tank yesterday, very impressed so far. Great to hear, let us know if there’s anything we can help you with. I have had mine up and running for a few weeks now. When doing my weekly water change and general cleaning of the tank I have noticed what I can only describe as white gunk on the long filter tube. I have cleaned this off and then it is back again when I go to do another water change. Good move from the Flex to the edge! Can you give me some more info and we’ll try our best to help? Do you use a bio treatment when you change the water? How long does it take to come back? Hi. I moved from the edge to the flex basically for ease of cleaning. The stuff only shows on the actual tube that goes from the pump to the outlet back into the tank. It’s kind of like a white slime. Seems to be there every time I do a weekely water change. It’s a cold water set up that I have. Just a few plastic plants and gravel in the tank and 4 oranda fish. Seems strange that it would form on the hose / tube and not anywhere else in the tank. My fish seem fine so I don’t think it’s harmful. Just wondering should I wipe it off the tube every time I clean the tank. Will try and get photos the next time I am doing a water change. I use fluval aqua plus and cycle when adding new water to the tank. Never noticed anything like this on the edge tank when I was cleaning it so it’s all new to me. I just checked the tube again and after my last clean last week there doesn’t seem to me as much of the slime back on the tube. Might have been to do with the tank only being set up for 4 weeks. It may have been an initial build up. There is still a small amount though. Won’t let me add a photo to this thread. I’m struggling a little with that one as I’ve not had a cold water tank in years and run the flex as a tropical. It’s sounds like you’re doing everything right with whats in the tank and the treatment. I’d make sure you clean it off when its there and hopefully it will settle down once the tank has been running a little longer. Sorry if I missed it in the write up but what have you placed in the bottom inlet holes to stop shrimp getting through? I was thinking about placing filter sponge down there…. Hi, you could do but I’ve not bothered personally. I don’t think the flow rate is that strong to pull them in and my shrimp have established themselves well in the tank. I occasionally find a baby guppy in the chamber for the filter but they swim themselves back out in due time. Probably best to use some sponge if the shrimp are new and very small but once they’re a reasonable size they’ll be fine. Hi. Have you changed your CO2 input? I see you used the Fluval CO2 for a while with the large diffuser in the tank but can’t see it in there in the new video? If so, what have you gone for now? Do you think Dwarf Hairgrass really need this? I have the larger Flex (not set up yet) and plan to have most of the bottom covered in the plant and was wondering if it really needs a CO2 system. Thanks! I’m still using the diffuser, I just took it out to clean the glass behind it and get some nice photos and video without it being in the tank. The Dwarf hair grass would be fine without it now but I think it helps to get it established. With the larger flex I’d 100% recommend adding C02 from the start if you want a full carpet across the bottom of the tank. The c02 that I’ve used in my flex would be sufficient for it with 2 fills a day. I’ve begun stocking my Flex 15g (57L) with 2 sunset honey gouramis and 6 salt and pepper corys. However, I’ve got an issue, the corys insist on swimming back into the first filter chamber and for the most part get stuck in there. Any suggestions how to keep them out? I’ve placed a few rocks and a plant in front without fully covering the slats, but the little dudes keep sneaking in there. Thanks! I’d put a thin wire gauze over the filer entry – this will solve your issue. Where would I purchase thin wire gauze? Thank you! I’d have a look on amazon or a local hard ware store. Hi any one got any ideas were I can get a gauze to cover the slats into the filter housing , I keep loosing my kuolie loach behind the back? I’d try this http://amzn.to/2oEVOaQ I’ve seen these but not personally used it. Looks like you should be able to cut the gauze to cover the filer. My LFS has recommended changing the compartment use of my 34L Flex. I have a sponge from a canister filter pushed into the bottom of the left hand compartment, which blocks off the bottom vents and I have the Fluval sponge unit on top of it which blocks off the top vents. I have 4 bags of ceramic bio-media in the middle compartment (and may add another if it will fit. This arragement has no detrimental effect on the function of the tank’s mechanical and biological filtration and seems to be working a treat. Why have they recommended changing it? Sounds fine to me! 1) Solves the problem of fish and shrimps getting through the vents into the left hand chamber as they’re now completely blocked off with sponge. 2) The middle chamber can be literally packed full of bio-media. I have 5 bags of the ceramic in mine. I now have 10 bags of varied ceramic media in my middle compartment which fills it to the waterline. The tank seems to be doing very well. Does it matter or affect the flow at all having it changed like that ? 1, The tube does come off the heater to be cleaned inside, it unscrews both ends despite the cable tie on it. 2, On the filter there is a little cover with the grill over, take this off and clean out the small sponge inside – this can easily clog and reduce the filters performance. Again let me know if this helps. Hi, I bought one today but am unsure about the light. Which light setting do I need to keep the plants healthy please? I previously had my lighting on a timer switch but with this lighting it seems to revert to the blue lights when it switches back on and I manually have to change it. Am I doing something wrong? Thanks!! I generally leave mine on just the white light, occasionally with another colour at the same time. It does reset to the flickering lights each time you turn it off otherwise. Very annoying if you want to put it on a timer switch. There’s no solution to this either. I’ve used one with a push button dial and it works fine. Have the white lights on full and the RGBs set to red for best possible plant growth. Whether, in the long run, the lights in the 34L are good enough for vigorous plant growth remains to be seen, but my Cabomba, Anubias Nana, Java Fern and Crypt Wendtii are thriving with that light setup at the moment. Sounds a good setup on the Flex, keep us updated with how you get on. Hi, I am looking to start up my very first tank, and I really like the look of the Flex. However I am undecided on which model to go for. I am looking at trying for a planted tank with the usual array of typical “newbie” fish, neons,guppys etc. I have heard that the 57ltr pump is too strong and the water flow would be a problem for these type of fish. Just looking for a bit of advice. Do I still go for the 57ltr or drop to the 34ltr. I’d personally go for the 57L Flex if that was going to be my main tank. I’ve seen one running in the local fish store and it didn’t have any issues with the flow. Adjusting the direction if the fish were struggling and having lots of plants would help make sure the fish were okay. Hi all. I’ve had the Fluval Flex for a month now and recently checked the filter compartment where I have the heater and the water level is just under half of the tank height. I’ve added dense sponges in the first section so my shrimps can’t get through and wondering if its only half full because the flow is restricted? Should the water level be level with the rest of the tank? Thanks! The water level should be the same as the tank – especially if you have your heater in there. I’ve had this in mine and there’s 2 things to try to resolve it (to make sure it’s not your sponge). 1, Check the water level – it needs to be at least half way up the top intake on the opposite side to the filter out flow. (Make sure your sponges in the middle are inserted fully too). 2, Clean the pump – There’s 1 small sponge in the pump that needs to be cleaned. If that’s clogged up it can slow the flow and pull rate of water. Take the pump out and there’s a cover on one side that comes off, you’ll find a small circle sponge on there. I recently had this same issue, I found that washing the black main filter block. Solved this issue. Just starving the pump of water. I do have some coarse foam block covering the lower holes. I recently am having issues with green algae and hair algae on my plants, could this be related to poor flow? How far up the slats on the left hand side of the filter compartment should my water be? Currently I have it just under, otherwise the water flow pushes the flake food all in there. I have mine over the intake and some food goes in there, but so do the fish and shrimp so it all gets eaten. I’d try having the lights on less to reduce the algae. Hi, how do i intro the CO2 tube into the tank since the cover is enclosed? I just took it through the back and then had the lid slightly propped on the tube – this didn’t effect the tank or C02 performance in any way. I’ve never slept next to it but it’s more a constant hum than a long noise if it’s running smoothly. Personally I couldn’t sleep next to it but the white noise may help some people sleep. Let us know how you get on if you get one. Hi, I’m just getting into aquariums and I was considering this tank as my first. So do you think that it would work as a beginner tank or would you reccomend something else (the Fluval Spec being another one I’m considering)? Thanks, and keep up the great articles, they’re really helpful! I’d 100% recommended this for your first tank. The square shap makes it easy to manage and get a nice design. The smaller Spec is tricker to work with as its narrow. Hope my reviews have helped, please let me know what you go for and how you get on with which tank you choose. I wouldn’t put it in the back compartment if it says to go diagonally. I’d suggest growing some plants in front of it to cover it if you don’t like it on the glass. An alternative, that I wouldn’t personally be keen on, is to use a very small amount of aquatic glue on the suckers if you do want to secure it on the back. This would be more permanent though. I broke the glass on my heater while performing a pump-impeller clean in my Flex 34L and, as it was 3pm on a Sunday, I was in a panic to get a new one. One store only had a long 50w heater which had to be placed diagonally and I want mine in the pump compartment. The only other open store had this Super Fish Nano Heater, 50w and nice and short (17cm) and able to be sited vertically. Panic over and the heater is performing well and the calibrated temperatures are very accurate. The sucker clips are more trouble than they’re worth in the pump compartment so I just hang In there, making sure it’s not touching the pump or the water hose, to avoid unnecessary vibration and hum. I kept tropical fish in the 70’s, I was looking for a small tank to start again my family bought me the 57l flex with stand. I’m really pleased with it, I researched quite a bit on gravel, plants etc, fish less and fish cycles. It was perfect to learn how to use test kits, using chemicals, water changes etc and it’s a very stylish tank, love it. I have noticed that my shoaling fish (Ember & Neon Tetras) in the 34L Flex were constantly near the bottom, facing the front glass and finning on the spot. I concluded that they didn’t like the force of the flow jets in the Flex. I bought a block of very coarse filter foam and cut a deepish slot in the block. This two vent nozzles were then pushed into this slot which had the effect of diverting the flow vertically downwards and diffusing the flow akin to a slowly running tap. The fish are all now constantly in the mid to upper layers. I will be keeping an eye on them to ensure that they are not suffering adversely from the lack of flow and that oxygen levels aren’t depleted. I just bought a block of black, coarse filter foam from my LFS. Use the foam block that comes with the Flex as a guide when looking for the right texture. Can’t say whether this is the best method but it works for me. The flow is now directed downwards rather like the flow that you get with a Fluval Edge. I am thinking of replacing my 23L Fluval Edge with the 57L Flex. My problem is using the cabinet the Edge stands on the Flex will an inch or so wider all round than the cabinet top, is this likely to cause any sagging problems at all. The Edge of course stands on its own base that is considerable smaller than the base of the tank, bit it contains considerably less water and so lighter in weight. Instead of foam to deal with the fish passing through the vents; these are available from Fluval: part number A14778 which is a slotted cover £1.99 for two, Google: Fluval Flex A14778. Or has this been tried before and rejected. Those new vent covers still have slots in that very small fish or baby shrimp could still get through. Using foam has the added effect of being a mechanical pre-filter. Thank you Kahlia. The Flex 57 has now been purchased (the white one). I have gone for the piece of board approach to stand the tank on. The pump system is being set up dry at this time (prior to tank dressing), and I have noticed that the flexible pipe from the pump motor to the compartment outlet is fractionally short, which exerts a tension on the rubber suckers under the pump motor, pretty close to pulling the motor off the tank base. It does assemble Ok, but I must say I’m a bit concerned that in time the pump motor will release from the tank base and start to move (knock) around in the compartment, if nothing else causing noise. Hi Peter, Mine in the 34L is very tight but it’s not come loose in over a year now. It seems to be the way they are setup. The hose is a tight fit but my tank has been going nearly 4 months and I’ve had no issues and the pump is very quiet. You will invariably leave a sucker or two on the bottom of the tank when you remove the pump, periodically, to clean the sponge and impeller. Since leaving my first reply I have rectified the problem of the too-short pump hose. Firstly the hose has a thread at the bottom that you can unscrew to around 5 or 6mm to lengthen the hose and it doesn’t affect the pump function. However, the purchase of some clear PVC aquarium grade tubing of 12mm inside diameter (£2.45 a metre) meant that the hose could be tailored to the right length to keep the pump’s sucker feet firmly attached to the bottom of the compartment and lessen the risk of vibration and noise. I am really struggling with my flex tank in the fact that the iron levels have turned it orange?? I cleaned and vacuumed but to no avail. Any input would be greatly appreciated? Do I need to start over, water etc? Hi Joanne, I’d personally start over if thats a possibility. You should have the black sponge in the middle, with the water just high enough to go over them. There should be no reason to replace the pump in the Flex. The lower levels are caused my the pump being made to work too hard to get the water with the additional mesh/ sponges. I’d strongly advise working back to the manufactures recommended setup and seeing how that does for a few days. Let me know how you get on. I have a modified setup, recommended by my favourite aquarists. I now have the new Fluval snap-in covers on the vents in the left hand compartment and have the big Fluval sponge block in there with a bag of crushed coral to maintain the pH of my very soft water at around 7.2. In the middle compartment I have 10 bags of various ceramic media (Fluval, Eheim, etc) so the biological filtration is, wpquite frankly, massive. In the right hand compartment I have my pump, which is VERY quiet and my heater. I have 2 small 1” cubes of coarse black sponge on the water outlet nozzles and the flow and turbulence in the tank are vastly reduced. My tank is planted with Java Fern, Anubias, Crypt Wendtii and a Bucephalandra. The tank is doing really well and I test my water levels weekly and change 35% of the water as the nitrates can be around 40-80ppm. Could I use this as a saltwater tank if I added a heater, I would only be looking to keep and possibly breed shrimp and snails and double up as a quarantine tank when needed? We have recently bought a flex 57 and have our 4 goldfish in it. The water has gone quite cloudy after just 5 days and I didn’t think this was going to a problem. I’ve done . 10% water change today. Another thing is that our fish don’t seem entirely happy not moving around as much as they did in their bio orb. Any help greatly appreciated. With out more details on what’s in the tank it’s hard to advise exactly what to do. But here’s what I’d check/ do. Change 30% of the Water and clean the filter. Add a biological condioner to the water and follow the “new tank” steps on it. Hi. I am thinking of upgrading from my fluval chi to the larger fluval flex. After reading a few reviews, people talk about the pump being noisy. People have different opinions of loudness however so I’m so wondering if you know how this compares. I did notice you mentioned changing the position of the pump seems to reduce noise so if I do get this tank I will definitely try this. The pump can be tweaked in position to make it less noisey. I’ve never felt it was a noisey tank. I’ve never used a Fluval Chi so couldn’t comment on the difference sorry. Hi, it should sit about half way up the meshing on the tank – it’s designed to mask the water level. Not a major issue if it falls lower than the mesh though as long as the filter section is full of water. Hi, can you link me to the clean up video? Would be really helpful especially regarding the pump. Hi, I’d say 20ish tetras would be okay depending on the planting and cleaner fish that you have in their as well. I’d take the advice of your local shop when buying the fish as they’ll be able to answer more specifically with knowing exactly what fish you are buying. New Fluval Edge 16 gallon tank has just been introduced and it looks to have identical features, compartments and filtration to the Flex but a more conventional shape and a gallon bigger. The hood looks to be a major improvement in that it has a section that can be removed to get at the rear filter compartments without having to take the whole lid off. Hi, Check the filter – theres a small sponge in it thats probably causing this. Thinking of getting this for my son’s birthday. Would it be ok on a set of drawers? They’re fairly sturdy but Ikea I think…. As long as they are sturdy and not too high they should be okay. Depending on the age of your son I’d say get the stand as there is a risk, if young, he could climb up the draws to see the fish. I’d say do the filter every 3 months along with the water change, just this does depend on what you have stocked in it though. Generally the tank will need a little top up every now and again. Help! What do we connect the light to? There is nothing in the instructions and nothing obvious. Hope you can help. UK instructions were awful! The light should be hard wired in from memory when I got mine. Let me know if you’re still having issues. Hi Dave, thanks for your kind words. I used an enhanced soil – if you see on the site there’s a blog about setting up a planted aquarium it will tell you the exact one (think it’s JBL one). Hi, I have Fluval Flex 34L and have bought a digital timer for the lights. However, the time makes the switch but the lights do not turn on. This has to be done using the Flex remote control. The time will switch the lights off tho. Is this an issue others are experiencing? Does anyone have a solution? You need a none digital charger for it to work. One of the ones where you push the buttons in to set the time – this is how I run mine and the advice came from Fluval directly. Hi Simon, even with the non digital times the lights always revert back to the plain white lights? Think I read somewhere on this blog that people had some success with digital timers? Sorry, that’s right – it should be a digital timer but as far as I’m aware it will always go back on white. I will try and find out if theres a way to do colour from Fluval and let you know. I have the fluvel flex tank. And I can only have the blue light on, I have bought a new remote (because my doggie chewed the other one) and I thought that this was why it wasn’t working! Could it be that I need a new bulb and it just gives you the blue light when a new one is needed? Hi Jackie, I’m sorry I don’t know the answer to this one. I’d try Fluval customers services. Have you cleaned out the small circle filter in the main unit at the bottom? There’s a small piece that comes off with a small filter in it – this is usually the cause. The outlet tube on my pump isn’t quite long enough so I can’t fix it to the bottom of its chamber using the suction cups as it doesn’t reach, the result is a very noisy loose pump. Would you know/suggest a solution? Is it also possible to buy replacement pump filters (little filter inside pump)? It’s a fluval flex tank and standard pump that comes as a complete kit. Thanks, James, you should be able to buy replacement filters from Fluval, if you check out http://www.fluvalaquatics.com/ca/fluval-products/replacement-parts/ you’ll find all the replacement parts. I’d suggest E-Mailing them regarding the tube being too short as they may send you a replacement out. Hi guys great blog. I set my flex up following your guide over a year ago. I’m planning on restarting the tank as I used black and white gravel on top of the substrate, which is quite grimy/algae ridden now. To avoid this in future I was thinking about having a sandy base? If I wanted to add plants would I use substrate first, then sand? Smalltanks.co.uk - part of 777 Marketing LTD (UK) is a participant in the Amazon Services LLC Associates Program, an affiliate advertising program designed to provide a means for sites to earn advertising fees by advertising and linking to amazon.com. Amazon, the Amazon logo, AmazonSupply, and the AmazonSupply logo are trademarks of Amazon.com, Inc. or its affiliates. Small Tanks Copyright © 2019.